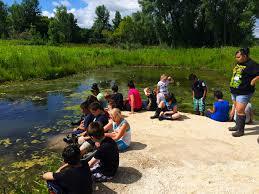 The Hyslop Foundation’s WATERshed (We All Take Environmental Responsibility) project educates 2,200 4th and 5th grade students in Racine and Kenosha on the waters of Lake Michigan and its tributaries. Many of these youth would not otherwise have the opportunity to learn about their local waterways. Students learn about the importance of safeguarding water resources and how human activities impact them. In the classroom and on field trips, they investigate stormwater discharges, wetlands and buffer zones, and water quality testing.